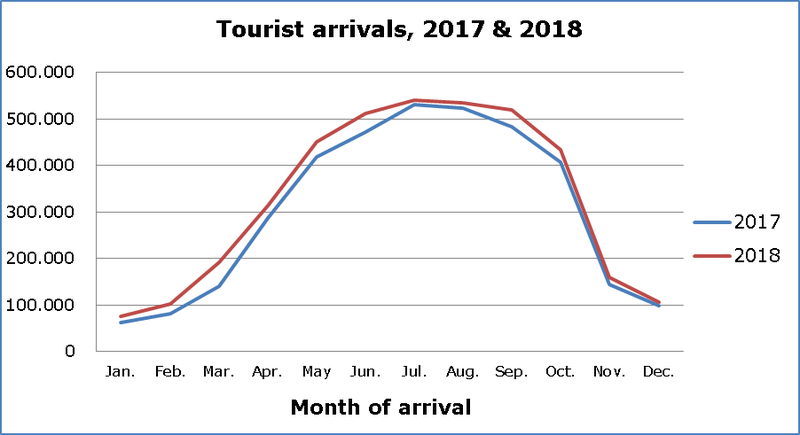 Tourist arrivals from the United Kingdom increased by 13.6% in December 2018 compared to December 2017 while an increase of 13.5% was also recorded for tourists from Greece. Contrary to that, a decrease of 18.8% in tourist arrivals from Russia and 7.2% from Israel were recorded. Percentage changes from one year to the next for the main countries of usual residence of tourists are presented in Table 1. The United Kingdom constitutes the main source of tourism for Cyprus for December 2018, with a proportion of 30.1% while arrivals from Greece comprise 14.8% of total arrivals, from Russia 9.4% and from Israel 8.7% (Table 2). For a percentage of 51.1% of tourists, the purpose of their trip in December 2018 was holidays, for 36.9% visit to friends and relatives and for 11.9% business (Table 3).